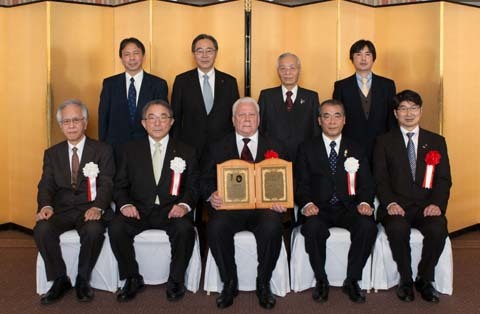 In commemoration of the 50 year-anniversary for the foundation of Atomic Bomb Disease Institute (GENKEN) at Nagasaki University and also the 20 year-anniversary of Nagasaki Association for Hibakushas’ Medical Care (NASHIM), the joint ceremony and symposium, titled “Nagasaki and Hibakushas’ Medical Care – A New Challenge for Radiation Health Risk Control: International Contributions and Efforts to Fukushima”, have been held at Best Western Premier Hotel Nagasaki on February 9-10, 2013. On the 1st day, the orders of the ceremony were as follows;(1) the opening speech by Dr. Makimoto, the president of NASHIM, Dr. Katamine, the president of Nagasaki University and Mr. Nakamura, Nagasaki Governor, (2) Introduction of history for GENKEN and NASHIM, (3) congratulatory speeches by guests of honor, (4) Memorial lectures by Prof. Yamashita (Light and shadow of civilization by science and technology: Global Perspective of GENKEN and NASHIM), and by Emeritus Prof. Tomonaga (Evaluation and future issues for research on radiation late effect in GENKEN), (5) Special lecture by Emeritus Prof. Nagataki (), and (6) Award of The Takashi Nagai Memorial Nagasaki Peace Award by Prof. Mykola Tronko at the National Academy of Medical Sciences of Ukraine. On the 2nd day, we also had the symposium with five speakers, including Profs. Takamura and Nagayama at GENKEN and Dr. Akahoshi at Radiation Effects Research Foundation, Sasaki at Hiroshima Atomic Bomb Casualty Council and Ms. Ariga from Ministry of Health, Labour and Welfare. The numbers of the attendance were ~200 in the 1st day, and ~100 on the 2nd day. Copyright© Atomic Bomb Disease Institute, Nagasaki University All Rights Reserved.